Ankle sprains are the most common athletic injuries and the most common orthopedic injuries presenting to emergency rooms. What we do not often consider is that only a small fraction of ankle sprains present to the emergency room and patients treat most injuries at home with differing levels of conservative care. Furthermore, the number of ankle sprains presenting to emergency rooms is so large that physicians often deal with them with in a limited fashion with an Ace wrap of some sort. This often results in pain for the patient, a delay in recovery, potentially untreated injuries and the need for surgery. Most ankle sprains will improve with conservative care as long as they are treated in a timely and aggressive manner. When a patient presents with an acute ankle sprain, the physical examination and diagnostic testing are essential to understand the level of trauma and what needs to happen to facilitate a rapid and optimal recovery. Check the skin for areas of bruising and swelling, and any skin breaks. Skin bruising is a clear sign of the area of injury. For example, if there is bruising or bleeding in the anterior shin region, one must suspect a syndesmosis or high ankle injury. 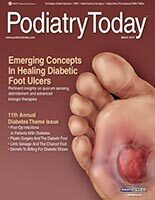 Check the vascular supply to the foot by palpating pulses. It is rare to have a vascular issue with ankle sprains but cases of severe swelling may cause a compartment syndrome, resulting in potential vascular insufficiency. If a suspected compartment syndrome is present, measure the pressure of the foot and ankle compartments. One of the most commonly missed issues in ankle sprains is neurologic injury. With medial ankle sprains, the tarsal tunnel, tibial nerve, medial plantar, lateral plantar and calcaneal nerves can be stretched or damaged. This is a less common type of ankle sprain and also a less common type of nerve injury. The more common lateral ankle sprains can present with a tension injury to the common peroneal nerve, the dorsal cutaneous nerves of the foot and ankle, or the sural nerve. I have seen several patients with common peroneal nerve problems after ankle sprain that were not detected and resulted in a drop foot deformity. Make sure to check for pain at the fibular head region and also check the strength of the dorsiflexors of the ankle. Also make sure to check dorsal foot and ankle sensation as a common peroneal nerve problem can result in dorsal lateral foot numbness. The most common problems with ankle sprain are musculoskeletal in nature and result in ligament tear, tendon tear, cartilage damage or fracture of the ankle. Some of these problems commonly include partial or full ligament tear of the lateral ankle region. However, some of the problems are less common and one may miss them. A missed diagnosis of these problems may result in devastating problems such as a syndesmosis injury. The ankle examination is difficult with early, very swollen ankle sprains but one needs to reassure the patient and perform testing in a timely manner. Anterior drawer testing and talar tilt testing are the most common tests. Palpation of the anterior ankle for crepitus and synovitis is also essential. Also check peroneal tendon tenderness or weakness as a severe inversion sprain can result in a peroneal tendon tear. In the event of medial ankle injuries, check the deltoid ligament and posterior tibial tendon for laxity or weakness. My biggest complaint about typical ankle examinations is the lack of understanding and poor early treatment of high ankle sprains and syndesmosis injuries. To check this problem, the patient bends the knee and hangs the leg off the bed. The patient holds the knee tight and one performs an internal and external rotation of the ankle with the foot dorsiflexed to check the ankle and distal tibiofibular stability. If external motion causes pain, suspect a syndesmosis injury. Furthermore, one should also suspect a syndesmosis injury if pain is present with anterior distal ankle palpation. Following the physical examination, conduct radiographic examination of the ankle. If the patient has a severe lateral ankle sprain, obtain foot and ankle views to rule out a fifth metatarsal base fracture. Check the ankle views for fracture, cartilage damage, osteochondral lesion findings and syndesmosis injury. Increased medial clear space is a clear indicator of a syndesmosis injury. However, more subtle cases can occur when there is a gapping of the tibiofibular overlap with more than 3 mm of overlap change. Comparing views of the anterior ankle to the contralateral ankle can be helpful in subtle syndesmosis injury cases. High fibular views can also be useful to check for a fibular neck fracture, which may cause common peroneal nerve irritation. It is rare to order a magnetic resonance image (MRI) with an acute injury but in certain cases, MRI may be beneficial. In cases of potential tendon tear, osteochondral lesions with suspected loose body or subtle syndesmosis injury, it may be useful to obtain a MRI. This is especially true with syndesmosis injuries. In such cases, if one notes a sole anterior or posterior tibiofibular tear, it may be beneficial to stabilize the area acutely to avoid long-term complications, especially if mild anterior or posterior shift of the fibula is present. Again, syndesmosis injuries can cause severe long-term complications so err on the side of aggressive treatment to avoid problems. Treatment of an acute ankle sprain is mainly conservative in nature. In most cases, the treatment is an ankle brace of some sort. The type of ankle sprain varies but the main goal of the brace should be to stabilize the ankle in dorsiflexion and protect against excess medial and lateral motion. I prefer an over the counter ankle foot orthotic brace in order to support the ankle and the foot, and prevent overpronation. I also prefer this brace because it allows the ankle to be held in a dorsiflexed position and also gives some squeeze to the distal tibiofibular region for added stability. When the patient has a very unstable ankle, such as a grade 3 sprain with complete ligament tears, I prefer a short period of either casting or boot use to allow the ligaments to heal prior to bracing. My patients usually use the boot for about two weeks until there is moderate healing of the ankle ligaments prior to bracing and therapy. I also have found physical therapy on an acute care basis to be very helpful. By starting early soft tissue therapy, there is less swelling and improved circulation leading to improved tissue repair. Soft tissue laser therapy has been exceptionally helpful in soft tissue healing and tissue repair. Furthermore, early proprioception exercises are helpful in returning the ankle to stability and a feeling of balance. In cases of loose bone or intra-articular cartilage damage that is loose in the joint, one should consider early arthroscopy to remove the intra-articular lesion and prevent arthritis. Early diagnosed osteochondral lesions without loose bodies usually undergo treatment with boot use. In order to allow for healing, patients are non-weightbearing for a period of about four weeks. One should subsequently obtain a repeat MRI to check the improvement in cartilage healing. At our institute, we treat syndesmosis injuries aggressively with open fixation. One may perform this with one or two syndesmotic screws, or tightrope syndesmosis fixation. I prefer the tightrope technique, which allows early motion and does not need to be removed at a later date like screws. I prefer to let small tendon tears heal with the ankle ligaments prior to any form of surgery. A period of boot use is suggested for four to six weeks to allow tissue repair. If the region continues to be painful, obtain a repeat MRI to consider the need for tissue repair. It is essential to be aggressive with ankle sprains. Remember that an ankle sprain is a partial joint dislocation and one should treat it as such. Be aggressive with bracing and physical therapy. Also be sure to check for what you may not notice at first glance in order to avoid long-term complications.